My oh my, how the time flies. 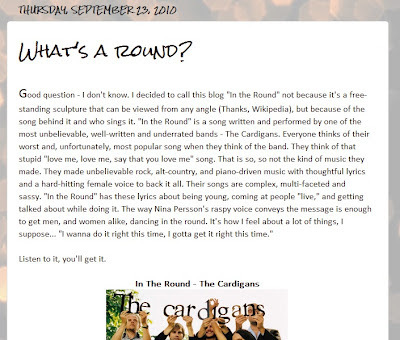 In The Round turned two yesterday, which is very odd because I remember writing my first post like it was a short second ago. 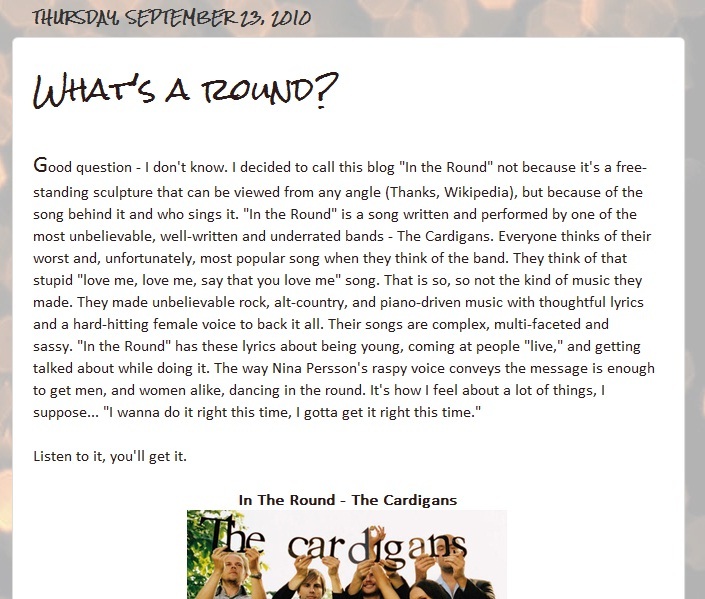 I woke up this morning to realize that a year ago I had set an Outlook calendar reminder to remind me not to miss my own blog's anniversary again (this happened last year) - and to post something short reflecting on the 24 months that have been spent thinking about new ways to share music and engage like-minded listeners on this site. I have to say, because of the wonderful audience and support I've had, it's hardly ever a struggle to find something to talk about on here. This has nothing to do with my own bank of musical knowledge, but more the community of music lovers and open minded song-savvy readers who rarely discriminate and join me in mingling with both classic and unknown sounds. I'm sure it was Bono, or someone else Bono-esque and worldly, who commented on music's powerful ability to bring people together. And, in the least sappy of ways, I'll simply say that I wholeheartedly understand that. When I first started this, I didn't know what I wanted out of it other than that - and today it still rings true. Thanks to everyone who keeps coming back to do a little reading, a little sharing and a little listening. This is, without a doubt, one of my favourite places to come - and is absolutely one of the reasons that my love for songs, sounds and words grows daily! To sum up a few great years of talking about tunes, here are a handful of my very favourites of all time - as well as the song behind the blog - to start your week. Thanks again for hanging around here!